Authentication is the process of ascertaining that somebody really is who he claims to be. In Hadoop, this is achieved via Kerberization. This post will not cover any details about this as there’s ample material already available online. Authorization refers to rules that determine who is allowed to do what. E.g. Manoj may be authorized to create and delete databases, while Terence is only authorized to read the tables. For folks who are coming from a traditional database world, authorization is a well understood concept. It involves creation of roles, grants at various levels on variety of objects. Apache Hadoop community is trying to emulate some of those concepts in the recently incubated Apache Ranger project. We recently implemented this in one of our customer sites and talk about that experience here. Ranger provides a centralized way to manage security across various components in a Hadoop cluster. Currently, it’s capable of providing authorization as well as auditing for HDFS, Hive, HBase, Knox and Storm services. At the core, Ranger is a centralized web application, which consists of the policy administration, audit and reporting modules. Authorized users will be able to manage their security policies using the web tool or using REST APIs. These security policies are enforced within Hadoop ecosystem using lightweight Ranger Java plugins, which run as part of the same process as the Namenode (HDFS), Hive2Server(Hive), HBase server (Hbase), Nimbus server (Storm) and Knox server (Knox). Thus there is no additional OS level process to manage. In addition, this means there’s no single point of failure (for example, if the web application or the policy database goes down, security is not compromised. It just disables security administrator from pushing new policies). Portal/Policy Manager is central UI for security administration. 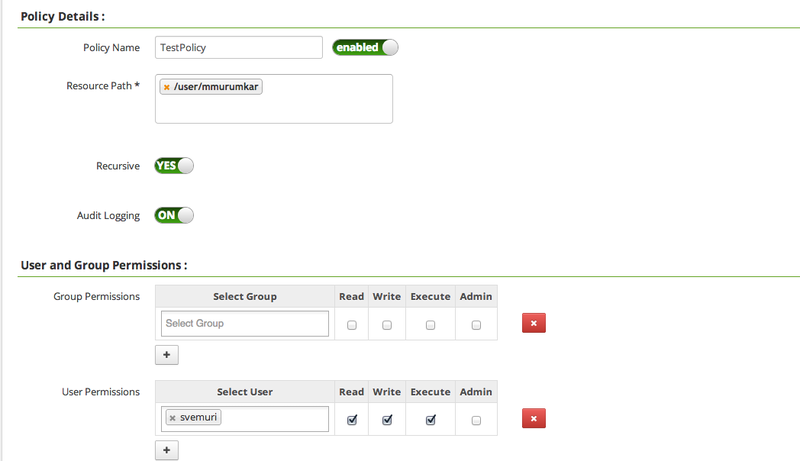 Users can create and update policies, which are then stored in a policy database. Plugins within each component poll these policies at regular intervals. Plugins are lightweight Java programs which embed within processes of each cluster component. For example, plugin for HDFS runs as part of the namenode process. The plugins pull policies from the policy database at regular intervals (configurable) and store them locally (in a file). Whenever a request is made for a resource, the plugins intercept the request and evaluate against the security policy in effect. Plugins also collect data for all the requests and send it back to the audit server via separate thread. User/Group Sync is a utility provided to enable synchronization of users and groups from OS/LDAP/AD. This information is used while defining policies (and we’ll shortly see an example). NOTE: Customize SYNC_LDAP_USER_SEARCH_FILTER parameter to suit your needs. Verify by visiting ranger portal and clicking Users/Groups tab. You should see all LDAP users. Furthermore, you may add LDAP/AD user/group and it should show up in the portal within SYNC_INTERVAL. We will go over one of the plugins. Similar setup should be followed for all interested plugins. On NameNode (in case of HA NameNode setup, on all the namenodes), install the plugin. In the plugin installation directory (/usr/hdp/current/ranger-hdfs-plugin), edit install.properties. Restart namenode(s) from Ambari or manually. On ranger portal, click “Policy Manager”. Click “+” sign on HDFS tab and create a repository. Ensure name of this repository is EXACTLY same as the one you specified during installation. Audit records will now show up in audit UI on the portal. Apache Ranger is starting to fill critical security needs in Hadoop environment, marking a big progress towards making Hadoop an enterprise data platform. So you don’t need to setup a separate server outside of the cluster to run Ranger on? Nice blog ..Thanks for the post. Excellent blog, you have provided a lot more useful information than Ranger’s docs. I agree, this product will eventually be an excellent addition to HDP but they do need to sort their docs out.